For all you basketball fans out there, March Madness means only one thing: college basketball at its best. 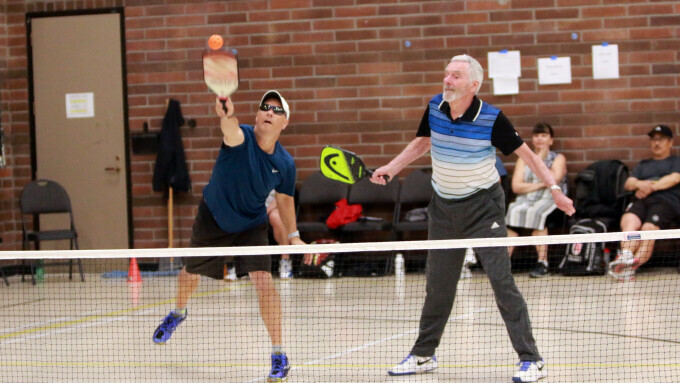 At SDBC, March Madness means something else: the spring pickleball tournament, which was held last Saturday, in the gym. Twenty-eight competitors competed in three categories to pit their skills against one another. Some intense competition and incredible shots took place. Spectators cheered on all the players during some good, wholesome competition. After the finals, our Skills Challenge had both players and spectators vying for chocolate treats. It was fun to see so many people trying to put the ball in the garbage can in the Spring Clean-up Challenge, sinking a 3-pointer in the 3-Point Challenge, and bouncing the ball in the Pickleball on the Edge Challenge. We then moved into the Chapel and had a wonderful lunch organized by Brenda, Mario, and their kitchen team. Players and spectators got a chance to chat over hamburgers and freshly baked chocolate chip cookies. After lunch, Landon Kitagawa, our guest speaker and a runner-up in the tournament, shared his thoughts on pickleball at the church. He noted how players chat while sitting on the sidelines, help each other out with their games, and just get to know each other. He then went on to share his thoughts about the church community at South Delta Baptist, talking about how we, as a church, are called to love, care for, and support each other throughout our lives. God has blessed us with this wonderful facility and we are on mission to reach out to people in our South Delta community. For more information, please visit our pickleball ministry page.